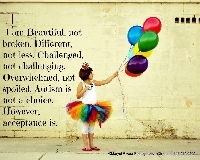 April is Autism Awareness Month...I like to call it Autistic Acceptance Month. I have a few swaps going on for AAM. So, wether you are Autistic, a Parent of an Autistic or just know someone Autistic...these swaps are for you! Everyone is welcome to join. This is USA only, but if you would like to make an international one, PLEASE do. I will be checking profiles. I will angel.